In a time where gas prices only likely to rise, cars are becoming less attractive to commuters, and bikes are growing more popular. Many major cities are jumping on the bicycle bandwagon, trying to make their streets friendly to two-wheeled travelers. The best bike trail cities are those that have put the most money and time into developing their network of bike trails, regardless of the size or location of the city. The best bike trail cities are as diverse as bike riders themselves. In no particular order, here are the cities that are considered friendliest to bikes. Minneapolis, Minnesota: You may be surprised to see this chilly city on the list, but Minneapolis makes up for its cold weather with its impressive network of bike lanes and other accommodations for bicyclists, including bike carriers on buses and a bike rental program in the works. Portland, Oregon: Portland was one of the first bike-friendly cities. Its bicycle network has only expanded over the years, adding more miles of bike tracks, allowing riders to easily access all parts of the city. The city has recently added bicycle parking areas all over the city to make it even easier for Portland residents to explore their city on two wheels instead of four. Tucson, Arizona: Tucson has recently demonstrated a commitment to becoming bicycle-friendly, requiring all new street construction (and reconstruction) to include bike lanes. 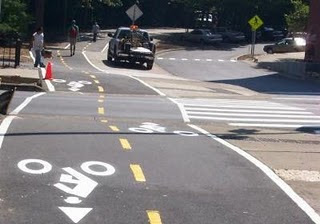 The city has hundreds of miles of bikeways, including bikepaths that cut through the quiet areas of the city, allowing cyclists to avoid traffic congestion. The year-round sunny weather doesn’t hurt, either. Boulder, Colorado: Boulder provides bike lanes on 95% of its major streets and commits 15% of its transportation budget to bikes—a strong commitment to making the city accessible to bikes. Many of the bike paths are set up to avoid intersections, allowing riders to travels across the city as quickly as possible. Seattle, Washington: Seattle has developed a plan add a 455-mile network of bike trails in addition to its already impressive system of bikeways. The city has added bike racks and is working to promote biking through community outreach over the next three to five years. San Francisco, California: Despite its infamous hills, San Francisco has found a place as one of the US’s bike-friendliest cities. The city is compact, and most neighborhoods are easy to bike to. Additionally, most streets have bike lanes. The city has also installed signage to help point bikers to less hilly routes. New York, New York: Despite leading the nation in bike theft, New York remains one of the friendliest cities for bicyclists. The city plans to build a bike path around Manhattan, in addition to adding bike lanes to city streets. Drivers may not always be friendly to bicyclists, but pro-bike organizations in the city are working to change that. Chicago, Illinois: Already friendly to bikes, Chicago has mounted a campaign to becomes America’s most bike-friendly city by the year 2015. The city has 315 miles of bikeways and the thriving McDonald's Cycle Center in Millennium Park, and it’s hoping to add more trails and facilities over the next few years. This is only a list of the best bike trail cities in the country, not the only cities with bike accommodations—many other cities are well on their way toward becoming friendly to bicyclists. These cities have led the way towards becoming more welcoming to residents on two wheels and popularizing bikes as environmentally friendly, convenient, and healthy.